Yellowstone e o primeiro Parque Nacional mundial. Foi criado em 1872 e possui 2.2 milhoes de acres, sendo 80 % deste total de florestas, 15% de pradarias e 5% de agua. 96% de sua area se situa no estado de Wyoming, 3% em Montana e 1% em Idaho. Mais conhecido por seu geisers (Old Faithful sendo o mais famoso), o Parque e composto de varios outros elementos como lagos ( sendo um deles o Yellowstone Lake - o maior lago dos Estados Unidos), rios (Yellowstone, Gardiner - que atravessa o Parque de norte a sul - Madison, Firehole, etc. ), riachos, quedas d'agua belissimas como as do Grand Canyon of the Yellowstone, cadeias de montanhas como a Gallatin Range, vales como Hayden e Lamar e as Bacias de Geisers Norris, Morning Glory Pool, Mud Volcano, e fontes de agua quente como as Mammoth Hot Springs. Inumeras trilhas (mais de 1.000 milhas) possibilitam caminhadas por todo o Parque. Pode-se pescar, esquiar,cavalgar, avistar vida selvagem (passaros, alces, bufalos, veados, corujas, aguias...e ursos (black e grizzly). Da outra vez que visitamos o Parque entramos pela parte do sul e fomos ate a saida norte. Desta vez entramos pelo acesso leste e percorremos toda a Big Loop Road visitando todos os pontos principais. Ficamos no Parque por 3 dias e acampamos dentro dele mesmo pois existem varios "campgrounds" espalhados pelo Parque. Saimos pelo sul em direcao ao Grand Teton National Park. Este Parque foi criado em 1929 para proteger a cadeia de montanhas "Grand Teton", os lagos na sua base, bem como o vale em Jacksonhole. A vista das montanhas junto ao Jackson Lake e indescritivel!!! 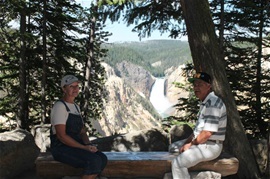 Yellowstone is the first world's National Park.It was created in 1872 and has 2.2 million acres, 80% of this area being forests, 15% prairies and 5% water. 96% of its total area lies in the state of Wyoming, 3% in Montana and 1% in Idaho. Famous and known for its geysers (Old Faithful being the most famous one) the Park comprises several other elements as lakes(one of them is Yellowstone Lake - the biggest lake in the US); rivers (Yellowstone, Gardiner - crossing the whole Park from north to south, Madison, Firehole...), creeks, gorgeous waterfalls like the ones at the Grand Canyon of the Yellowstone, mountain ranges as the Gallatin Range, valleys as Hayden and Lamar Valleys; and the Geyser Basins (Norris, Morning Glory Pool, Mud Volcano...) and hot springs like Mammoth Hot Springs - fantastic!! Several trails (over 1.000 miles) provide for hiking throughout the park. One can go fishing, skiing, horse riding, wildlife watching (birds, elk, deer, buffalos, owls, eagles...and bears - black and grizzly. The other time we visited the Park we entered from the south entrance and travelled the route towards the north entrance leaving the Park at the northside. This time we entered through the east and travelled all the Big Loop Road visiting every main spot. We camped inside of the Park and stayed for 3 days which allowed us to see most of the Park, and left through the south entrance towards the Grand Teton Park.